Even in the ugliest of realities, it is almost always possible to find some trace of goodness and order. 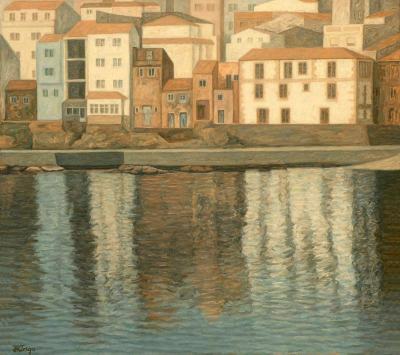 Here, the reflection in the water of a disparate group of buildings creates a kind of symmetry: two masses of white and blue are balanced against each other, separated —at the painting's central axis— by another of a dark, brick-like colour. Above, these same structures, submitted to a slight stylization, flaunt their geometrical beauty: prismatic, pyramidal forms, dihedral angles... recalling an architecture which is classical, monumental.